Long ago there was the City of Paris Dry Goods Company. 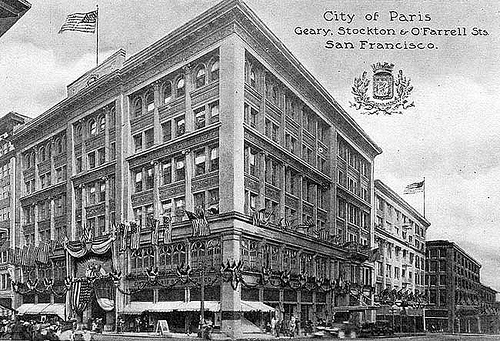 It later became the City of Paris, an important department store in San Francisco from 1850 to 1974. The building survived the 1906 earthquake and fire but sustained damage. 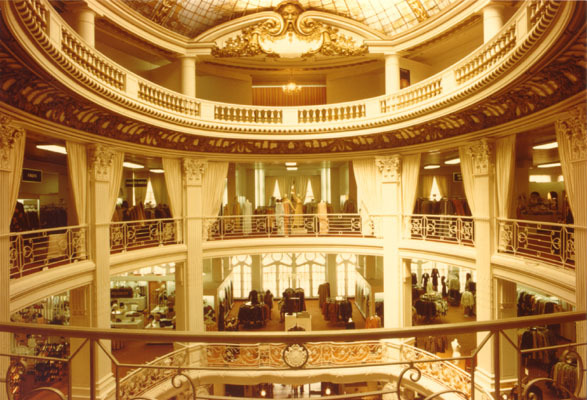 The interior remodel was redesigned by John Bakewell, Arthur J. Brown and Louis Bourgeois, graduates of the Ecole des Beaux Arts in Paris. It was rebuilt with a central, elliptical rotunda that was capped with a stained-glass dome. 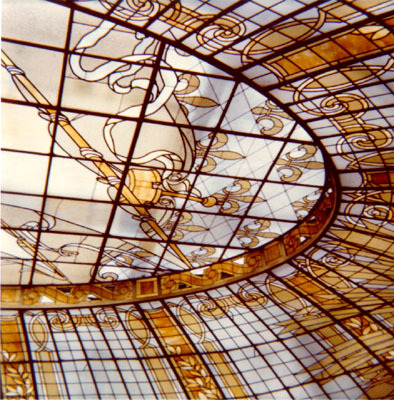 The skylit dome incorporates the store’s nautical origin and motto, Fluctuat nec mergitur(It floats but never sinks). 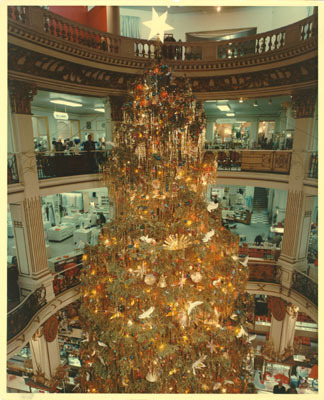 A forty-foot live Christmas tree was placed in the rotunda each year. 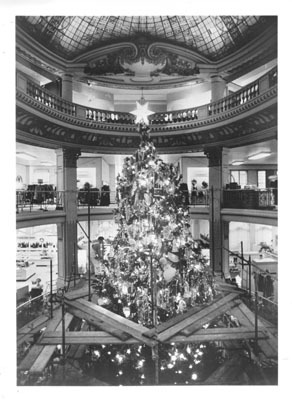 The front doors of the store were specially designed to be removed and this allowed for an opening large enough for the tree to fit through. The tree was brought in, set up and decorated all in the same night. Staff and their families would help decorate. Scaffolding was placed around the tree to facilitate decorating it. Further reading reveals that the tree would be put outside on the sidewalk on January 2nd and one could walk by it and really get a sense of its size. Here are a couple of additional interior images. What a beauty. It was listed in The National Register of Historic Places as a California Historical Landmark. 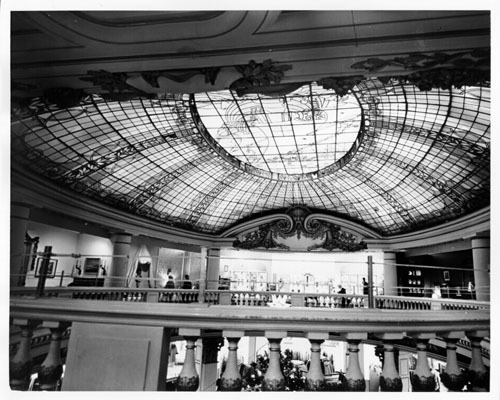 Alas, this fact and a protracted preservation campaign that went on for several years did not prevent it from being demolished in 1981 by the new owners, Neiman Marcus. 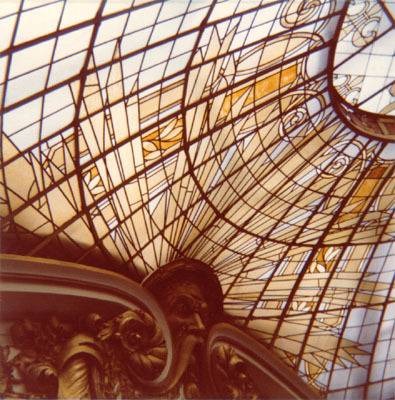 The stained-glass dome was restored and preserved by the new owners. 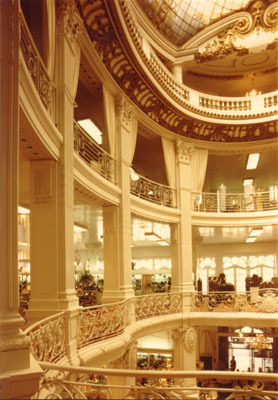 It has been reinstalled as part of the store’s entry and Rotunda Restaurant. The new Neiman Marcus building was designed by postmodernist architect Philip Johnson. I haven’t seen the building in person. I don’t know that I would like seeing the elegant and beautiful dome inside a modern box. What about you? Wikipedia entry: City of Paris Dry Goods Co. The Marshall Field & Company idea.